A Bald Eagle was found dead after accidentally being caught in a snare in central New Brunswick. 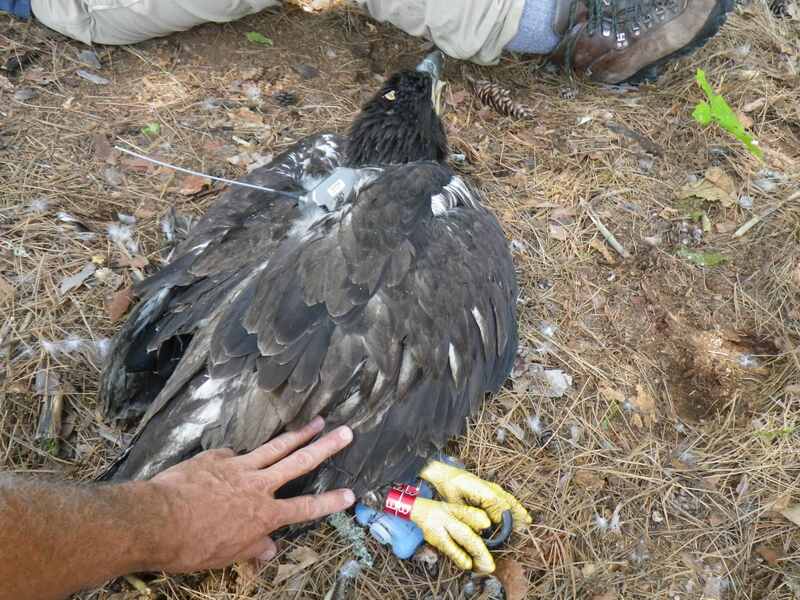 The unusual factor in this very unfortunate mishap, is that this eagle was equipped with a GeoTrak transmitter (Fig. 1). The eagle was banded with identification therefore local officials were able to contact the original bander to report the incident and receive details on the eagle’s life history. This bald eagle was banded before it could fly, on Lobster Lake in northwestern Maine in the summer of 2012. 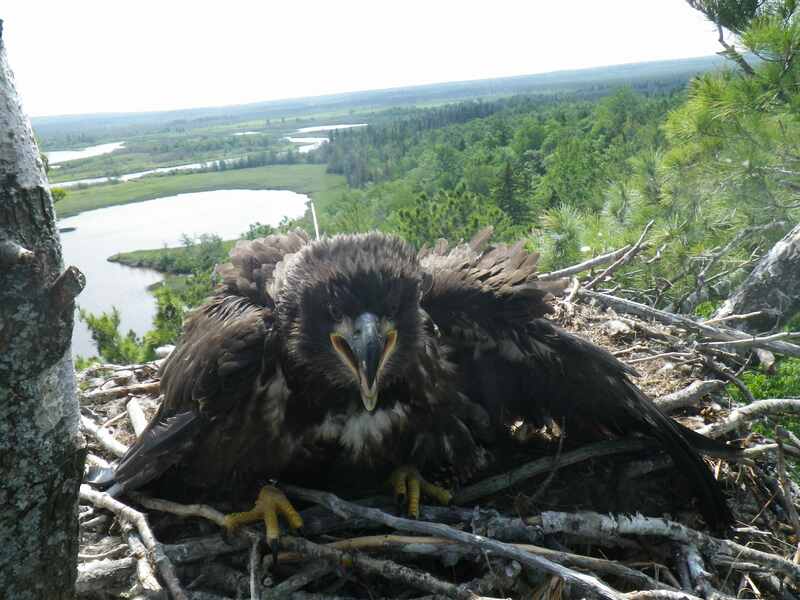 It was one of a dozen nestling eagles fitted with tracking devices as part of a Bald Eagle statewide study initiated in 2009 by researchers at the Biodiversity Research Institute (BRI) in Portland, Maine. This eagle had been transmitting movement data via satellite to BRI researchers from 2012 up until the late fall of 2017. 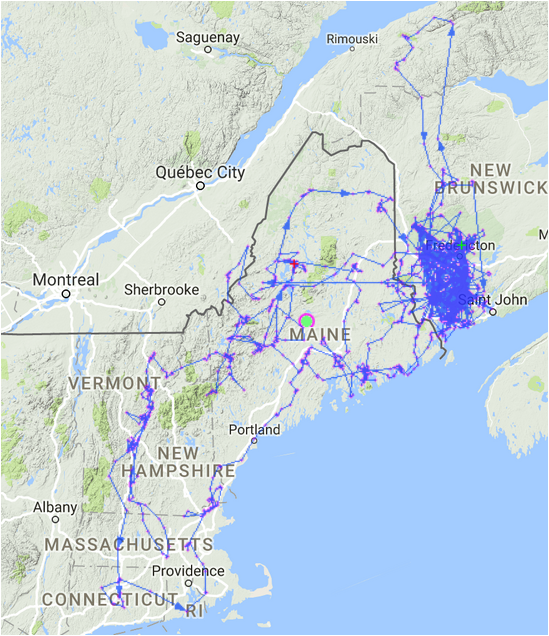 In the time since the bird was banded, it traveled through Maine and spent a significant amount of time in western New Brunswick (Fig. 2). These eagles have enabled researchers to identify habitats and resources important to sub-adult Bald Eagles, as very little is known about this species during the period between fledging and breeding age. The carcass was submitted by the New Brunswick Department of Energy and Resource Development to the CWHC – Atlantic in February 2018 for analysis. A necropsy was performed by Dr. Laura Bourque, a wildlife pathologist at the regional centre. Dr. Bourque found that this bird was in very good body condition and aside from a small amount of feather loss associated with the transmitter, there were no other significant lesions or signs of disease found in this eagle. 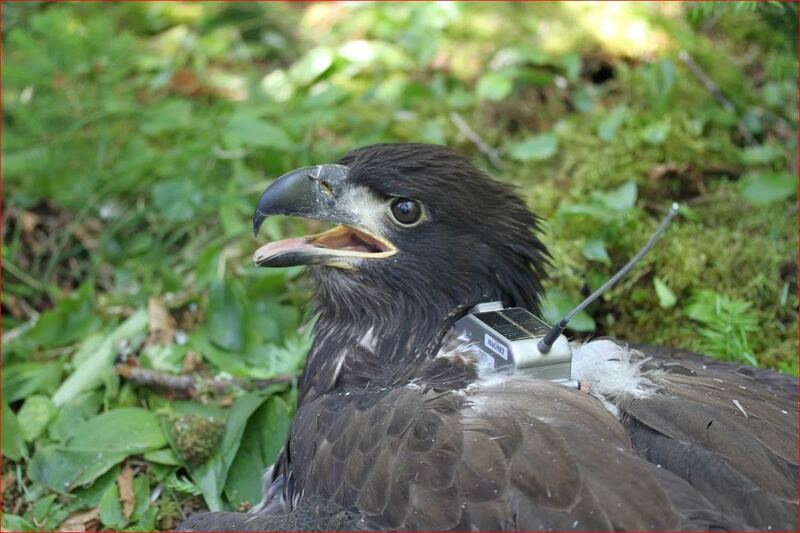 This is a relief to researchers, not only to have the eagle found, which is rare, but to also confirm that the transmitter did not have a negative effect on the eagle’s mobility and its ability to forage normally. As standard practice, a sample of liver was submitted for testing of lead toxicity which was negative. 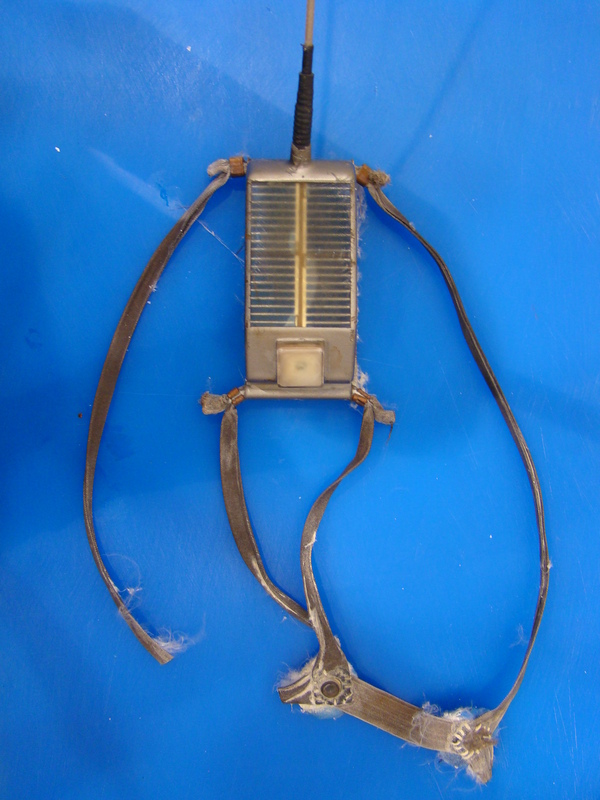 The transmitter and snare were sent to the raptor researchers in Maine, while the eagle carcass was given to the New Brunswick Museum in Saint John, NB. Fig. 2: Tracking map of the eagle’s travels between Maine and New Brunswick.